Microsoft is adding an end-to-end encryption option, powered by Signal, to Skype. ‘Private Conversations’ are powered by the Signal Protocol, which is already being utilised by WhatsApp, Facebook Messenger, and Google Allo among others. “At Signal, our goal is to make private communication simple and ubiquitous,” Signal’s Joshua Lund wrote in a blog post. 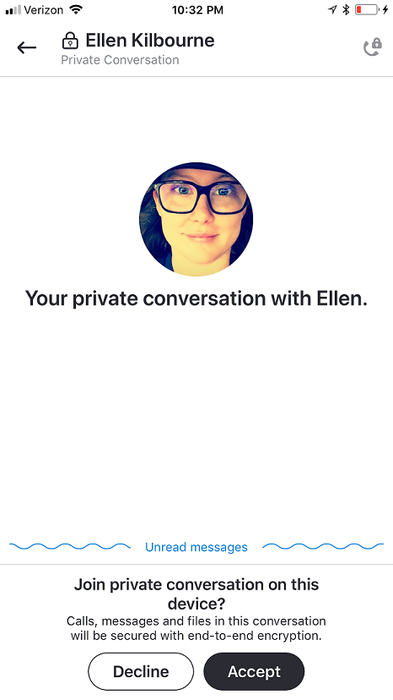 Available initially in preview to selected ‘Skype insiders’, Private Conversations are only available for communications between two individuals, and not supported in group chats. Its capabilities, for now, are limited. You cannot edit a message or forward a file. From the chat window, only emoticons, files and audio messages are available to send. Private Conversations are also specific to a device. A new invitation must be sent and accepted, to change to another device. “Up next, we’d like to improve the UX around the invite to join a private conversation and bring the experience to the Universal Windows Platform client,” wrote Microsoft support engineer Ellen Kilbourne, in a blog post. The Signal Protocol developed by non-profit Open Whisper Systems is considered to be one of the strongest end-to-end encryption options, scoring highly in the Electronic Frontier Foundation’s first secure messaging scorecard (currently being revised). Signal said it will continue to bring its open source protocol to other messaging platforms. “We’re going to continue our efforts to advance the state of the art for frictionless private communication, in our own app and in others. We’re excited about the future of Signal Protocol and the places it is going,” Lund wrote.